As the economic crisis deepens, Belarusian authorities have become increasingly worried about possible social unrest. There are good reasons for them to worry. Not only is the country in the midst of the worst economic crisis in its modern history, it also has a record number of political prisoners that has not been witnessed since Soviet times. Last week three former presidential candidates recieved long prison sentences. 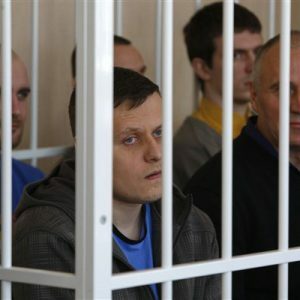 Mikola Statkevich was sentenced to 6 years in a high security prison, Dzmitry Uss to 5.5 years and Andrei Sannikau to five years. This is in addition to over forty other people who were held criminally liable for openly protesting against the falsification of the presidential elections in December 2010. Belarus' courts sentenced most of them to various prison terms. Belarusian authorities appear to be scared not only of political opponents but also of any public meetings. Yesterday police cracked down on a fully apolitical gathering of Minsk cyclers. The cyclers get together every month in central Minsk to encourage authorities to make the city friendlier for cyclers. But this time police decided to prevent their gathering and detained fifteen people. Today police also detained a number of participants of an international round table on the reform of the ministry of internal affairs. Shortly after their detention both the cyclers and the roundtable participants were released. 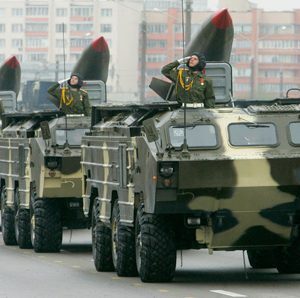 As the population is getting poorer day by day the Belarus regime does not want to take any chances. The main reason for the economic crisis was Russia's decision to cut down its subsidies to Lukashenka. And Moscow appears to be standing firm with its decision. Russian Finance Minister Kudrin even recommended Belarusian authorities to ask IMF for help. That will be very difficult given the influence, which the United States and the European Union have on the decision-making in international financial institutions. Western leaders made it clear than any negotiations about financial aid could start only after release of all political prisoners. This week even the United States President Barack Obama made a special statement condemning repressions against opposition in Belarus and sentences against former presidential candidates. Perhaps that was the first ever statement where he directly addressed the situation in Belarus. However, if Lukashenka releases political prisoners he may find himself in a difficult situation. Not because many will see it as his weakness. In the past he was successful in exchanging the freedom of political prisoners for a normalization of relations with the West. However, this time the things may not work out according to his scenario. Most active opposition leaders are now imprisoned. If released, their activities coupled with the rising popular discontent could be a seriously dangerous mix for the Belarusian regime. Moreover, the economic crisis is likely to deepen even further. In July, Belarus is supposed to fully open its market when the Customs Union arrangements between Kazakhstan and Russia will come into force. As a result, Belarus will find it very difficult to adopt protectionist measures for its domestic market. This may hurt its Soviet-style economy. Lukashenka may be looking for an exit strategy to avoid it, which may explain his recent anti-Russian rhetoric. During his recent trip to Kazakhstan, Lukashenka accused Russia of betraying the Belarusian people and trying to benefit from the crises in Belarus. According to him, the Russian rich hope to buy cheaply everything in Belarus and he will make sure it will not happen. He also made a few overtures to the West and hinted that political prisoners could be released soon. Lukashenka's rhetoric is unlikely to upset Russia or impress the West. He has used the same rhetoric many times in the past. However, Russia may be uncertain about what it should do with Belarus. It is unlikely that many in Russia want Belarus to turn into another South Ossetia — a completely dependent region subsidized from by the Russian budget and ruled by a small clique of kleptocrats. Belarus is much larger than South Ossetia and located in a more sensitive region of the world – right on the border of three NATO states and with Russia. At the same time, many in Moscow still believe that strategically it is not in their interest to let Lukashenka regime fall. Most likely they will wait until the economic problems will bring him to his knees. Then they will be able to dictate their terms. It is unfortunate that the population of Belarus and its political prisoners are serving as hostages in this geopolitical game.